This is a sample ‘Hexagonal Product Analysis’. 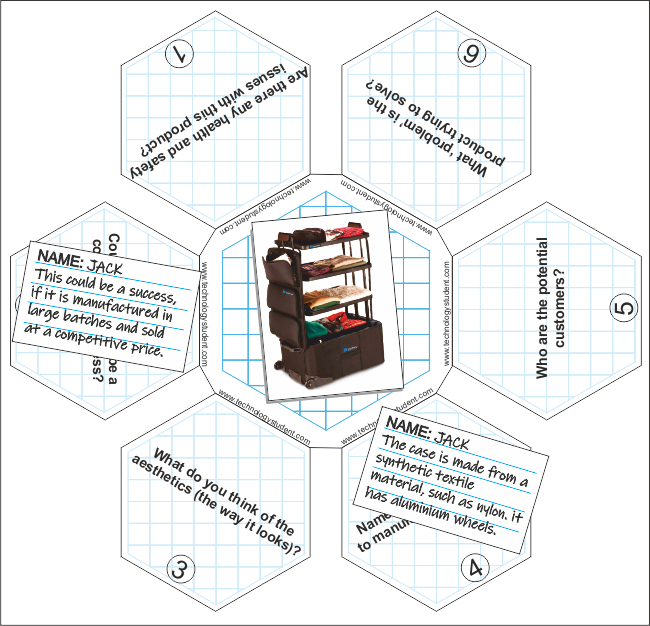 An image of a product is placed in the centre of the hexagonal analysis sheet (it may be a good idea to give each pupil, in a group of six, a copy of the image). A class of 24 could be split into 4 groups and each given a different product to analyse. The pupils are given a chance to look at the design and to discuss it as a group. They may want to discuss the six questions in relation to the product they have been given. After a few minutes, the pupils start to write their individual comments for each of the hexagons, on the blank slips. It is important that they have access to the internet for research purposes. Each pupil answers all the questions, filling out a blank slip for each answer. The completed slips are placed on correct question, on the Hexagonal Product Analysis Sheet. The groups can then discuss their findings and report back to the class. THIS TASK IS SUITABLE AS A PREPARATION TASK FOR ANALYSISING PRODUCTS FOR THE NEA (NON-EXAMINATION ASSESSMENT).